Speed describes only how fast an object is moving, whereas velocity gives both how fast it is and in which direction the object is moving. If a car is said to travel at 60 km/h, its speed has been specified. However, if the car is said to move at 60 km/h to the north, its velocity has now been specified. The big difference can be noticed when we consider movement around a circle. When something moves in a circular path (at a constant speed, see above) and returns to its starting point, its average velocity is zero but its average speed is found by dividing the circumference of the circle by the time taken to move around the circle. This is because the average velocity is calculated by only considering the displacement between the starting and the end points while the average speed considers only the total distance traveled. The average velocity is always less than or equal to the average speed of an object. This can be seen by realizing that while distance is always strictly increasing, displacement can increase or decrease in magnitude as well as change direction. In terms of a displacement-time (x vs. t) graph, the instantaneous velocity (or, simply, velocity) can be thought of as the slope of the tangent line to the curve at any point, and the average velocity as the slope of the secant line between two points with t coordinates equal to the boundaries of the time period for the average velocity. From this derivative equation, in the one-dimensional case it can be seen that the area under a velocity vs. time (v vs. t graph) is the displacement, x. In calculus terms, the integral of the velocity function v(t) is the displacement function x(t). 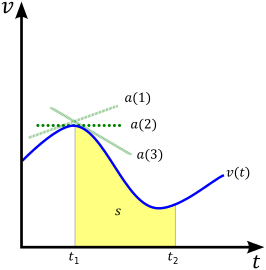 In the figure, this corresponds to the yellow area under the curve labeled s (s being an alternative notation for displacement). Since the derivative of the position with respect to time gives the change in position (in metres) divided by the change in time (in seconds), velocity is measured in metres per second (m/s). Although the concept of an instantaneous velocity might at first seem counter-intuitive, it may be thought of as the velocity that the object would continue to travel at if it stopped accelerating at that moment. where v = |v| etc. The above equations are valid for both Newtonian mechanics and special relativity. Where Newtonian mechanics and special relativity differ is in how different observers would describe the same situation. In particular, in Newtonian mechanics, all observers agree on the value of t and the transformation rules for position create a situation in which all non-accelerating observers would describe the acceleration of an object with the same values. Neither is true for special relativity. In other words, only relative velocity can be calculated. where γ is the Lorentz factor and c is the speed of light. where G is the Gravitational constant and g is the Gravitational acceleration. The escape velocity from Earth's surface is about 11 200 m/s, and is irrespective of the direction of the object. This makes "escape velocity" somewhat of a misnomer, as the more correct term would be "escape speed": any object attaining a velocity of that magnitude, irrespective of atmosphere, will leave the vicinity of the base body as long as it doesn't intersect with something in its path. Relative velocity is a measurement of velocity between two objects as determined in a single coordinate system. Relative velocity is fundamental in both classical and modern physics, since many systems in physics deal with the relative motion of two or more particles. 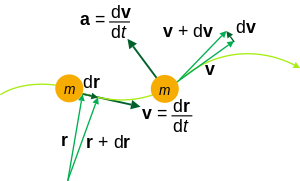 In Newtonian mechanics, the relative velocity is independent of the chosen inertial reference frame. This is not the case anymore with special relativity in which velocities depend on the choice of reference frame. Usually, the inertial frame chosen is that in which the latter of the two mentioned objects is in rest. , if the two objects are moving in the same direction. In polar coordinates, a two-dimensional velocity is described by a radial velocity, defined as the component of velocity away from or toward the origin (also known as velocity made good), and an angular velocity, which is the rate of rotation about the origin (with positive quantities representing counter-clockwise rotation and negative quantities representing clockwise rotation, in a right-handed coordinate system). The radial and angular velocities can be derived from the Cartesian velocity and displacement vectors by decomposing the velocity vector into radial and transverse components. The transverse velocity is the component of velocity along a circle centered at the origin. The magnitude of the radial velocity is the dot product of the velocity vector and the unit vector in the direction of the displacement. and the magnitude of the displacement. Angular momentum in scalar form is the mass times the distance to the origin times the transverse velocity, or equivalently, the mass times the distance squared times the angular speed. The sign convention for angular momentum is the same as that for angular velocity. is known as moment of inertia. If forces are in the radial direction only with an inverse square dependence, as in the case of a gravitational orbit, angular momentum is constant, and transverse speed is inversely proportional to the distance, angular speed is inversely proportional to the distance squared, and the rate at which area is swept out is constant. These relations are known as Kepler's laws of planetary motion. Robert Resnick and Jearl Walker, Fundamentals of Physics, Wiley; 7 Sub edition (June 16, 2004). ISBN 0-471-23231-9. 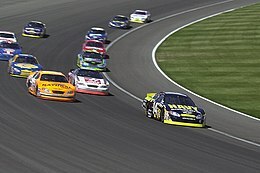 Wikimedia Commons has media related to Velocity.